If you love camping, but don’t like sleeping on the ground then an air mattress or camping pad is perfect for you. They provide a comfortable sleep while also being portable and not taking up a lot of space when not in use. A camping pad is generally a thinner, self-inflating air mattress that uses open-cell foam insulation inside. The best camping air mattress is one that is lightweight, packs small, extremely durable, and one that inflates and deflates easily – often using a battery powered pump. While there are some more expensive models, prices generally are less than $100 and can be found for as cheap as about $20. Below we review our choices for the best air mattresses for camping. In addition we also provide a list of the best air mattresses for in-home use and those models could be used for camping if you have easy access to a standard electrical outlet. We also provide a comparison chart at the bottom of this article so you can easily compare one model versus another. 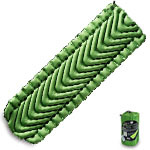 We selected the Exped MegaMat 10 Sleeping Pad as the best air mattress for camping. It comes in three sizes with the cheapest costing $189. This thing is so comfortable you might want to use it for your regular bed as well. It also will keep you toasty warm in any weather with an R-value of 9.5. The MegaMat 10 self inflates and comes with a mini pump to top it off to the final dimensions 77.6 x 30.3 x 3.9 inches for the long extra wide version which is a decent size for one person. That model weighs just 5.6 pounds. The biggest negatives are that it’s not cheap and it’s a bit on the large size when packed away. It can also take a bit of effort to get all the air deflated and rolled up. 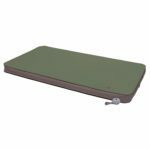 Overall if comfort is your primary reason for getting a camping air mattress then look no further, this is the sleeping pad for you. For couples the good news is that Exped also makes the Exped MegaMat Duo 10 which fits two people very comfortably. This model is very expensive with a price of $349 but you will not find a more comfortable sleeping pad around. Available in two sizes with the larger being 77.6 x 52 x 3.9 inches and weighing 10.1 lbs. This model is also self-inflating comes with the mini pump to help fill it all the way. The biggest knock against it is its price – you might pay more for this one than the mattress you sleep on every night, but this thing might just be more comfortable as well. The Megamat Duo 10 is also a bit unwieldy and it can be a bit of a pain to pack away. 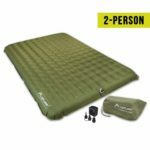 Overall the Exped MegaMat Duo 10 is the best camping air mattress for couples. 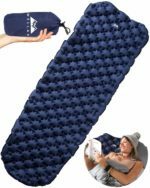 Another very comfortable sleeping pad for camping for a single person is the $85 Lightspeed Outdoors XL Super Plush FlexForm Premium Self-Inflating Sleep and Camp Pad. This self-inflating pad is 3 inches thick, weighs 6 lbs, and has an R-value of 9.66 so it will help keep you toasty warm even in winter. This Lightspeed Outdoors model self inflates to final dimensions of 77 x 30 x 3 inches. You can add a few breaths of air to customize your level of support and then use both valves for faster deflation. It packs away to a size of 30 x 7.75 x 7.75 inches. We feel the Lightspeed Outdoors XL Super Plush FlexForm Pad is the best air mattress for camping under $100. The best air mattress for backpacking campers in four seasons is the Klymit Insulated Static V LITE 4-Season Sleeping Pad which sells for $95. This thing weighs just 1.23 lbs and has R-value of 4.4 which makes it perfect for backpackers who camp in cold weather. This Klymit model completely inflates in 10 to 15 breaths to the final dimensions of 72 x 23 x 2.5 inches. It packs away to a size of just 5 inches by 8 inches. It also is built with high end fabrics and 30d polyester and comes with a limited lifetime warranty which means this thing is durable. We really only recommend this model for backpackers who need to pack light. For regular tent campers you can find bigger, thicker, more comfortable air mattresses. The best queen-sized air mattress for camping under $100 is the Lightspeed Outdoors 2-Person PVC-Free Air Bed which sells for about $83. This deluxe air bed is more durable, puncture resistant, lighter, and less prone to stretching or ballooning in comparison to traditional PVC air mattresses thanks to the superior TPU (Thermoplastic Polyurethane) material used in its construction. Since it only weighs six pounds and packs smaller than traditional air beds, it is extremely portable. It comes with a pump powered by 4 D batteries and inflates to 79 x 55 x 6.25 inches and can be adjusted from soft to very firm. We really could not find anything to complain about this model and highly recommend it for all camping situations. 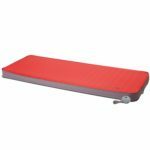 The best sleeping pad for backpackers under $50 is the $45 Klymit Static V Lightweight Sleeping Pad. This version it’s not insulated and thus only has an R-value of 1.3 which means you should not use it in winter. 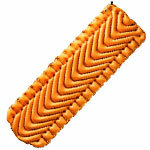 You can inflate this model with just 10 to 15 breaths to the final size of 72 x 23 x 2.5 inches. It is great for backpackers since it weighs just 1.16 pounds and packs away to a size of 3 by 8 inches. It also comes with a limited lifetime warranty. 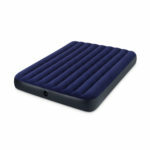 Another cheap option for a camping air mattress, especially backpackers, is the $40 WellaX Ultralight Air Sleeping Pad. This thing is the lightest sleeping pad on our list at just 0.9 pounds and packs down to a size of 10 inches by 3.5 inches. You can inflate it fully with just four to five breaths to a size of 78 x 24 x 2.5 inches. It has an r value of 2.1 which makes it okay for warm weather but not good for cold nights. The quality of construction, however, is not quite as good as the Klymit models and it only comes with a one-year warranty. 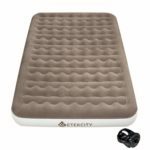 Those of you looking for a larger queen size air mattress should consider the Etekcity Camping Portable Air Mattress which sells for $70. This mattress comes with a rechargeable pump that can inflate the air mattress in about a minute. The final dimensions are 80 x 60 x 9 inches which makes it the largest air mattress for camping on our list and it weighs 13.8 lbs. The Etekcity Camping Portable Air Mattress is large and affordable, however it is nowhere near as comfortable as the Exped MegaMat Duo 10. It also does not have the same quality construction as the Lightspeed Outdoors 2-Person Air Bed. The best queen-size camping air mattress under $50 is the Coleman QuickBed Elite Extra High Airbed which sells for $45. This thing has a built-in pump that is powered by 4 D batteries that inflates the mattress to a final size of 78 x 58 x 9.5 inches. This Coleman model has a tendency to lose air overnight, so we really only recommend it for campers who only use it a few nights per year and want an affordable air mattress. If you need a cheap camping air mattress then you can’t go wrong with the Queen-sized Intex Classic Downy Airbed which sells for just $15. This thing is far from the best and will probably lose some air overnight while you sleep, but at this price it is hard to complain. It measures 80 x 60 x 8.75 inches. Buyers need to be aware that this model does not come with a pump. You can buy a pump or use an air nozzle on an air compressor to blow it up. 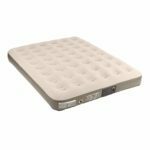 The Intex Classic Downy Airbed is for someone who needs the cheapest air mattress they can find for just a couple of days use either indoors or camping. Just don’t expect to get a lot of use out of it.